Not a bad day. 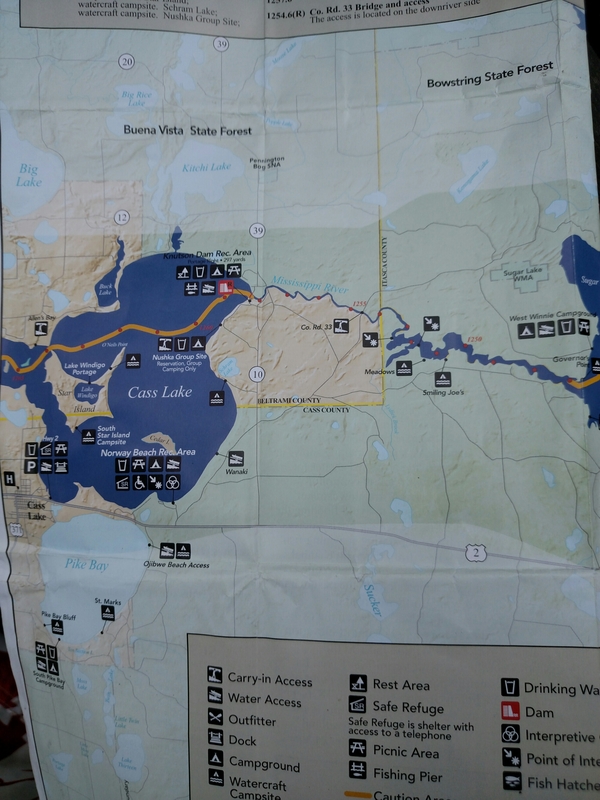 Paddled about 18 miles to Lake Winnibigoshish. 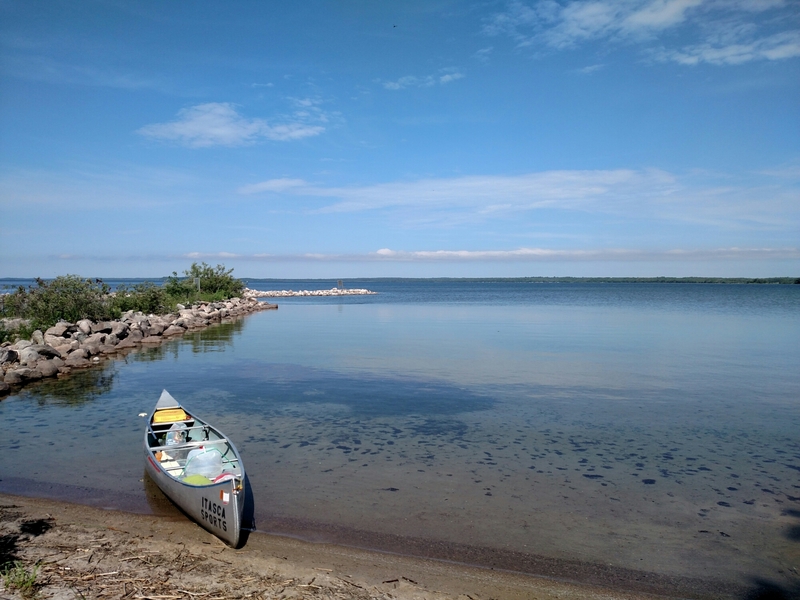 I got up really early this morning because there was supposed to be a storm later in the day, and paddled across Cass Lake. I also woke up early because yesterday I had planned on staying at Star Island but it got dark before I could reach the camp site, so I had to pull into a boat launch at Allen’s bay. This is not a recommended thing to do because you’re likely to encounter traffic and locals. However, I got lucky and it was quiet all night long. There was a fish cleaning hut and I bathed and charged up my electronics. I made sure I was up and out before anyone showed up in the morning. It was smooth and no wind! Yay! Once I got to Knutson dam I debated and whether I should go on or stay and wait out the storm. Well, there was no storm. It was sunny, hot, and beautiful. So, I decided to paddle on. Before I left, I ran into a fellow paddler named Kristyna (sorry if I misspelled your name) and we chatted for a bit. George, the campground host offered to give us a ride into town so we could stock up on needed supplies. I was in desperate need of sunglasses since I crushed my this morning. I wish words could express my gratitude! Thank you, George and Lois Hartshorn! I’ve met so many really nice people on this trip. I hope the kindness continues! I tried talking Kristyna into paddling together, at least to cross Lake Winnibigoshish more safely. She was in a kayak and had too much gear and I was in a canoe with too little gear. I figured it would benefit both of us if I took some of her gear and ballasted my canoe and lightened her load for the crossing. I believe she had been paddling with a guy before arriving at Knutson Dam and had a falling out of sorts. So she wasn’t keen on the idea of teaming up with another paddler she didn’t know. I can’t blame her. Everyone’s journey is their own. It was still early in the day, so I bid farewell and paddled on towards Lake Winnie. Upon on entering Lake Winnibigoshish, I missed the water access campsite and decided to stay at Winnie Campground. After climbing stairs and walking a long trail, I decided to carry gear that far wasn’t going to happen. I went back to the dock and there was a young man getting in his boat. I told him what I was doing and he said, “You’re crazy. Is there any chance you smoke bud?”. I looked at him crazy and paddled away. I suppose if I had some weed, they would have taken me fishing. On the way to Winnie Campground, I noticed a white sandbag hanging in a tree. I paddled back down there and sure enough, there was the DNR campsite Governors Point! Not a bad little site but the stagnant smell of the water there was strong. I opted not to bathe.